Did you know thereare literally hundreds of studies supporting the use of dietary supplements?Most of the studiesconfirm that even the very few of us who eat a balanced diet could be lacking important vitamins and minerals. They report taking dietary supplements should not replace healthy eating; rather, they encourage that supplements be used as a way toplug “nutrition gaps”. Clinical studies are proving certain nutritional deficiencies can lead to adverse health conditions such as extreme hair loss, thinning hair, weak nails or bad skin. That’s why Dr. Susan Lin formulated a variety of easy-to-use dietary products. Her passion for overall health, beauty and hair restoration (including specialized knowledge of hair loss for women)lead to the development of MD Nutri Hair and MD Ultimate Green Supplements. Unfortunately, there is no such thing as a miracle baldness cure. However, MD Nutri Hair supplementsmay bethe next best thing! These clinically-tested, 100% drug and hormone free daily supplements address oil on the scalp, while restoring dry, brittle, damaged hair. They work quickly, and deliver real results in combatting bothersome hair breakage. For those who suffer from mild to moderate hair loss, results may be seen in as little as 4-6 weeks due to the synergy of powerful ingredients. MD Nutri Hair supplements contain many botanical extracts which actually jump-start healthy looking hair. Lignan/Flaxseed Powder: Nourishes the scalp in addition to the roots and shaft of the hair. You may have heard the hype around trendy green tea supplements, and asked yourself “Do green supplements work?”Yes, studies prove they do! Furthermore, did you know there are green supplements that offer many more health benefits than green tea alone? That’s where MD Ultimate Green daily supplements come into play. If you’ve been searching for a beauty-boosting supplement to help you achieve glowing skin, nails and hair – then look no further! MD Ultimate Greensupplements contain enzymes from a rich array of organically grown terrestrial plants that are skillfully blended with aquatic plant forms to supercharge your beauty regimen. MD Ultimate Green supplements are like a beauty superfood, blended with 16 natural nutrients… such as Hawaiian spirulina, chlorella, barley and wheat juice powder, high pectin apple fiber, Icelandic kelp, Nova Scotia dulce—and the list goes on. Not only will these supplements improve the appearance of your hair and nails in as little as 30 days, you’ll also notice the emergence of glowing, younger-looking skin. These supplements contain no chemicals, artificial hormones, preservatives, sugar or artificial ingredients. They are a good source of vegetables that provide high energy, yet they contain only 12 calories. They are also excellent for overall body detoxification–which is an additional reason as to why they are a valuable part of any weight management program. 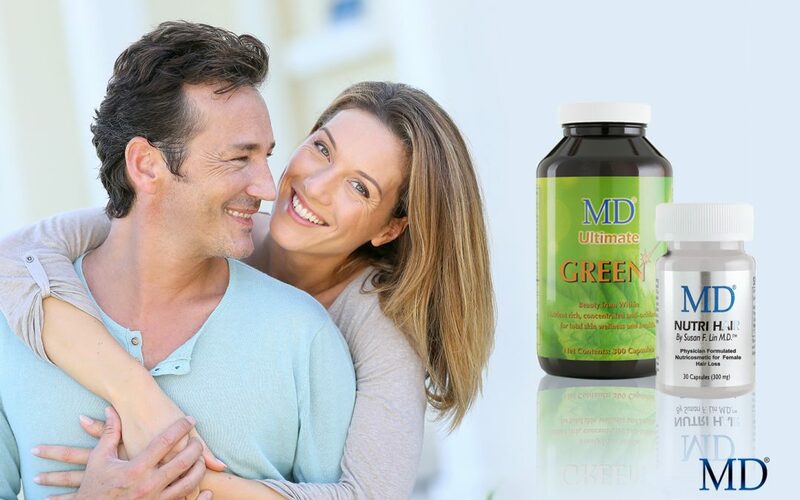 Give MD Ultimate Green a try and experience the health benefits of “green vibrance”! Commit to Beauty from Within … the MD Way! For over 25 years Dr. Susan Lin has been on a quest for the most advanced breakthroughs in the health and wellness of women, hair restoration and skin beauty. Her collection of innovative hair, skin and wellness supplements utilize the latest anti-aging technology and have won many international awards. You’ll find themhere at www.md-factor.com; as well as the finestaesthetic centers, salons and retailers in 24 countries around the world.